From the first meeting our minds were put at ease and we knew Kody would be in very good hands and loved. Thank you! The service was absolutely outstanding. We felt it was a much better fit for our Rylee. Thank you, Andrew and staff! Excellent Service! Will use Pets Are Inn again. The host family boarded both my dog and my mother’s dog when we went on vacation together-it was very easy! Excellent and courteous service. Will use Pets Are Inn all over again. It was great “peace of mind” to have our dog stay with a host family. Great Experience! Would highly recommend. It was so great to leave our “scaredy-cat-dog” with a loving family instead of a “scary” kennel. We have used Pets Are Inn for our dog, Penny, numerous times. We love the attention that he gets when he stays with his Host family. Teresa is wonderful. Love the service! It’s such a relief not to worry about Beau when we are away. It was great “peace of mind” to have our dog stay with a host family. Great Experience! Would highly reommend. I was so pleased with both Stephanie and Bev (the host family) Mr Wiggins came back happy & healthy. I would recommend you to everyone! It was so great to leave our “scardy-cat-dog” with a loving family instead ofa “scary” kennel. Excellant/Courteous service. Will use Pets Are Inn all over again. Excellant Service! Will use Pets Are Inn again. I was very happy with the service and will definitely use it when we go away again in August. 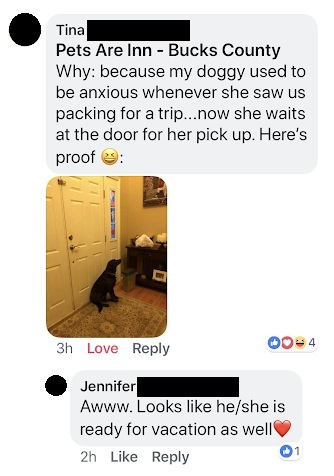 The host family boarded both my dog and my mothers dog when we went on vacation together-it was very easy! I was nervous at first because I was not able to meet the host family but I called the five references & they all had great things to say about the service. Rocky came home very happy. Thank You! Wonderful experience. The feedback from the host family erased any doubt that my pet was well cared for. We feel both dogs were very well taken care of. All of their individual needs were met. Everyone at Pets Are Inn made us feel comfortable as this was the first time to board our dog. 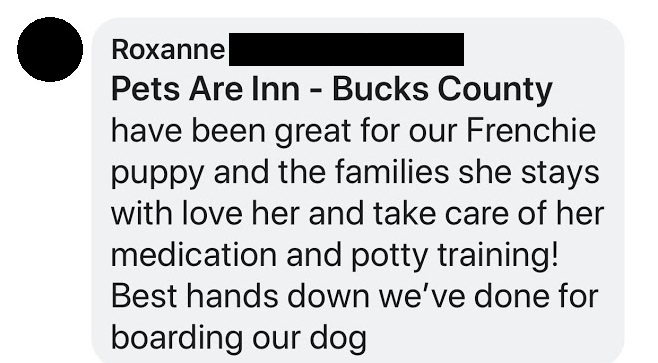 We are very pleased with the service. I would like to thank you for helping me with Molly on such short notice and placing her in a loving home. Obviously our pet received excellent care. Very grateful. We love our pets.